Scary that people like this are teaching history to our kids. And you wonder how you get people like David Hogg? 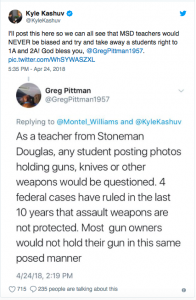 Pittman is an American history teacher at the Marjory Stoneman Douglas High School. It’s clear that he doesn’t know anything about the law. Kashuv was ordered to the principal’s office, locked in the room and questioned by school security and the Broward Sheriff’s department without his parents. He’s 16. His crime? He went to a gun range with his dad and posted pictures about it. There were no threats or anything that could be interpreted as a threat. But they referred to him as the ‘pro-Second Amendment kid,’ leading Kyle to think they might be trying to intimidate him. He has not been shy about criticizing the Broward Sheriff’s Office for failing the students.